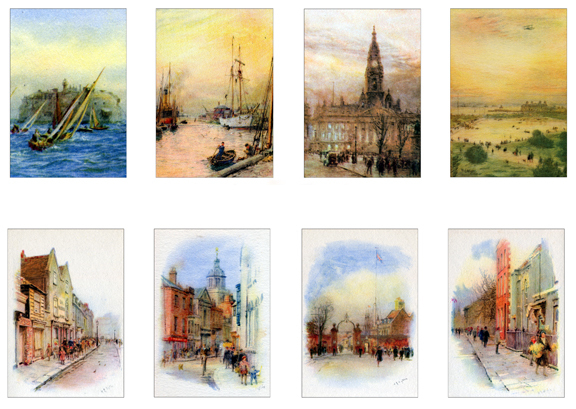 In 1931 the British Art Company Ltd. published a book of 10 watercolour views titled, The Old Portsmouth and the New Southsea. The little book, which cost 1/6d (7 1/2p),was among the last pieces of work Wyllie produced before his death. 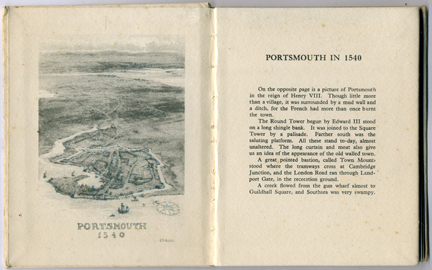 The picture on the front cover and the dust jacket shows a view of Canoe Lake, Southsea. 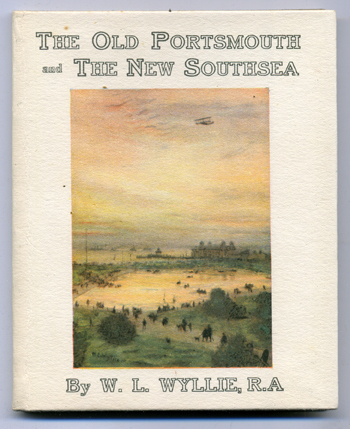 Inside the front cover Wyllie painted an aerial view of Old Portsmouth as it might have appeared in 1540, a similar view is on the inside of the back cover showing the area as it might have been in 1762. 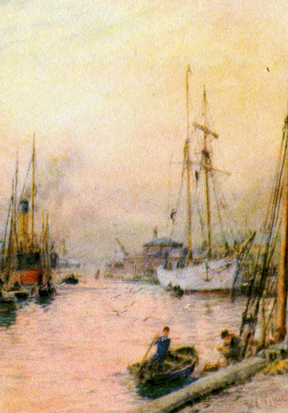 The original watercolours are now part of the Portsmouth City Museum's collection. Above is a view from the book showing the Bridge Tavern, centre, at the Camber Dock in Old Portsmouth, a pub I knew well in the late 1960s and early 1970's when the landlord was Max Neale, a well known local personality with a wicked sense of humour. The hostlery was mainly used by colliers and stevedores from around the world and the French onion men who came to Portsmouth every summer to sell their wares from old bicycles with handlebars festooned with strings of onions. The walls and ceilings of the pub were covered with paper money, postcards and newspaper cuttings from all over the world. Amongst them was a photograph of 'Hurricane' Clark, Atlantic sailor. The picture interested me so Max let me copy it. One day in the 1980's I was in Lymington, the yachting town in the New Forest, and called into an old book shop. It was gone 5 o'clock and the owner wanted to lock up. He asked me what I wanted, I asked if he had anything by Wyllie. 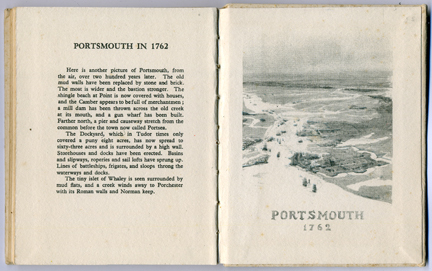 He went into his back room and after sounds of piles of books being shifted, reappeared with a copy of The Old Portsmouth and the New Southsea. I paid him the £3.00 he was asking and put it in my pocket. On the way home to Portsmouth I got in a traffic jam, so got the book out to have a look at it. I turned a page to find the inscription, 'From old Hurricane Clark on his second voyage to America, and in distress put into Tenerife where he received great hospitality. To the A......? Consul ubn. Scott.' I was amazed, 'Hurricane' Clark must have had the book aboard his boat and given it to the Consul in gratitude. How the book made its way back to Lymington will never be known, anybody else buying the book may not have known about or made the connection with the photo in the Bridge Tavern. 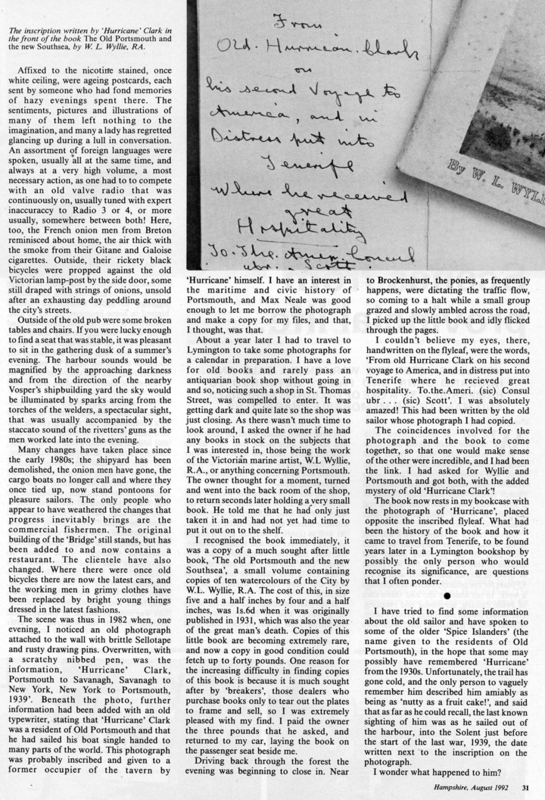 I wrote the story for the Hampshire magazine in August 1992 and have reproduced the article below. What happened to 'Hurricane' is unknown, a few years ago the local paper ran a story about him and a resident of Old Portsmouth told me he thought that at the start of World War Two 'Hurricane' had sailed out of the harbour into the sunset and was never seen again. 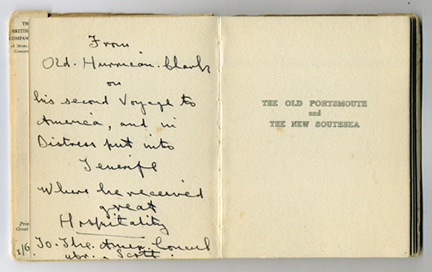 Above: Hurrican's inscription in the Wyllie book. 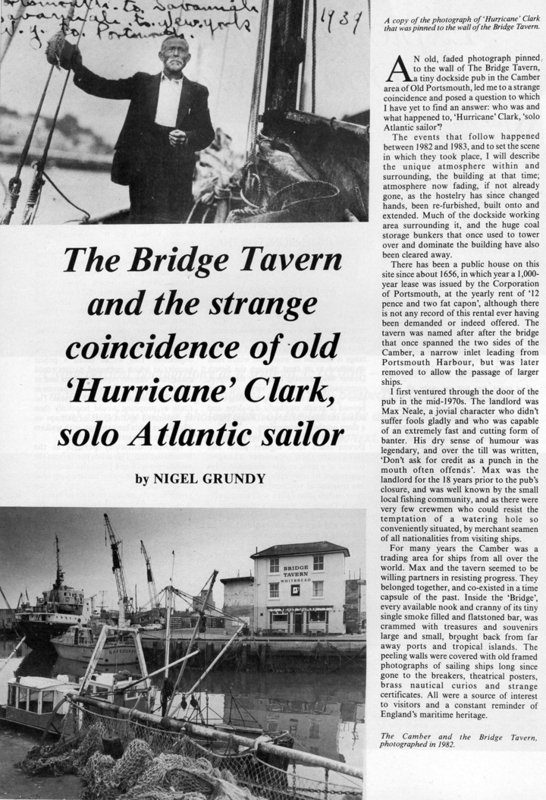 Below: The story in the Hampshire Magazine, August 1992, and the photograph that hung in the Bridge Tavern. In the 1980's the pub was refurbished and extended and now incorporates a restaurant.